4 seat convertibles are a common format despite the average family car having more than four seats. This is due to the chassis and body design required for a convertible car. 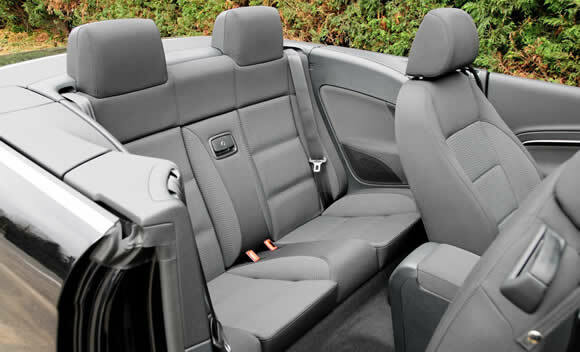 The rear seats in a convertible are generally narrowed by the thicker side walls which will enclose the sides of the roof when it is folded. This alone makes many convertibles only wide enough inside to seat four. There is also the issue of chassis design. In order to provide a chassis stiff enough to give an acceptable drive when a roof is removed from a previously hardtop car, engineers must make considerable modifications. These changes usually include reinforcement of the sills – the structural box sections on either side of the car below the doors. In addition, a central beam may run down between the seats. This will give the floor a W cross-section and remove any leg room for a centrally seated passenger. The same structural issues are also the reason for there being very few four door convertible cars available. 4 seat convertibles are among the most popular drop-top cars. They may not be quite to the level of driving dynamics of the hardtop cars on which they are generally based but the top-down driving experience is what makes them special. Open-air driving fun can be had by all the family although when choosing a car it is worth checking how windy it can get for back seat passengers. The best 4 seater convertibles combine practicality with open-air fun. There’s plenty to choose from to suit any budget, from the mighty Bentley Azure down to the lovely little Fiat 500C.